Most people know LinkedIn can be a very powerful career tool, but not everyone knows how to make the most of it. One thing you should bear in mind is why people are actually using LinkedIn; to network, to build their career and to hire, including companies screening people who have applied to them. Here are some simple things you can do to maximise your profile, irrespective of if you’re looking now or not. Note – If you don’t want everyone to see that you’re making changes en-masse don’t forget to change the “notify your network” setting otherwise your changes will pop up in your followers’ news feeds. LinkedIn sin # 1 has to be no profile photo with sin #2 being a bad profile photo. Stats vary (because that’s what stats do) but your profile will get significantly more views if you have a photo than if you don’t. • Your photo should be just you, looking into the camera, dressed professionally and smiling! An empty profile is almost as bad as no profile. Why bother signing up if you’re not going to add any detail? You should include as much information as possible including work history, job title and, most importantly within IT, skills and qualifications. People use key word searches to find profiles and if yours doesn’t actually say that you’re a C++ developer you’ll never be found. Filling out your complete career history might take a bit of time but once it’s done it’s easy to just keep it updated. There is a section for your contact details which is visible to your connections, but it is also a good idea to include contact details in your summary. That way you can be contacted, even if someone isn’t connected with you. To link to twitter or not to link? You are able to link you LinkedIn profile to other profiles, such as Twitter. This can be both a great idea and a terrible idea depending on how you use your other profiles. Link any profiles that are primarily used for work related activities. If it’s purely private and not something you’d want a future boss to see then don’t link. Your feed might mix the two but if you’re going to link it, make sure you avoid anything NSFW or political. 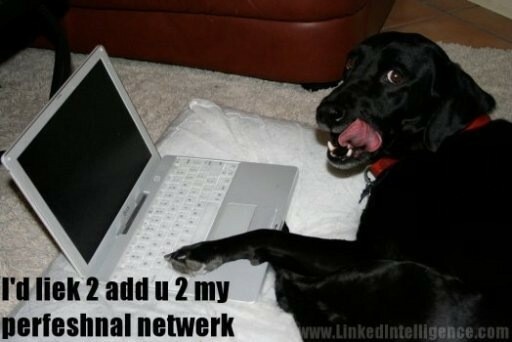 A great way to build your LinkedIn presence is by getting involved with relevant groups or forums. It’s all about demonstrating your knowledge and interest in a certain area and using your network to expand your own knowledge. The more you post, the more your name will become known plus you’re able to keep up with any news regarding your industry. If you see something in your news feed that you like, that’s relevant to what you do, like or share it. You should also be posting updates of relevant content yourself. Anyone can now publish their own content as well using the publish function. It’s a great way to get your thoughts in front of a wider audience. Some people only connect with other people that they know in a professional capacity but they’re missing out on a whole network; friends and family. You never know, your friend might be linked to your next boss, client or mentor! The jury is still out whether you should connect with people you don’t know. Officially LinkedIn say you shouldn’t but I believe that by connecting with others in your industry, you are increasing your scope of influence and widening your own knowledge pool. I’d also recommend following companies that work in your field or that you would like to work for. As you start to interact with them, you’ll get yourself noticed. I’d also recommend connecting with recruiters. A lot of us post useful general career advice (not just about job hunting) and when it does come to job hunting you’ll have a pool of people you can go to. This is an important point. LinkedIn is a professional network for professional networking. It’s not about your holiday photos, what you ate for dinner or any of the other stuff that should be posted on Facebook. No-one wants to see lolcats in their news feed! Some people pretty much ignore their profile when they’re not looking for a job. That’s not such a great idea, a good profile will build your reputation so that people can come to you. You never know, you might just get an offer you cannot refuse whilst keeping up to date with the latest industry news.